Starring: Marina Sirtis from Star Trek: The Next Generation , Tim Russ and Manu Intiraymi from Star Trek: Voyager, Doug Jones from Hellboy and Pan’s Labyrinth and Morgan Lariah. 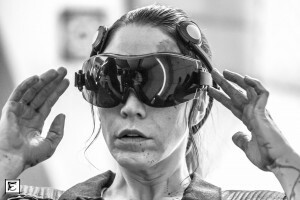 Scott Baker had an idea for a sci-fi film that he kicked around for several years. When he met Morgan Lariah, that’s when the concept really began to evolve. Scott and Morgan worked together for months writing and developing the story. When completed they had an intense, thrilling, and ambitious script and it wasn’t long before they began putting a cast and crew together to make 5th Passenger. Morgan Lariah stars in 5th Passenger and also is one of the writers and producers. She kindly shared the film’s conception and how the team and cast all came together. So a bit about the writing process and how it began. Scott came up with the initial idea and brought it to an independent filmmaker group for a table read. He met Morgan there and approached her with it because he felt she would be perfect for the lead character. He started writing scenes for it and she would give him feedback. At some point, she began writing scenes too and from there it was a collaboration of them re-writing it over and over again. Scott met Manu Intiraymi on another independent film shoot (Scott does steadicam along with DP work). Manu was a great fit for the role of Thompson so Scott gave him the script to read. Manu liked the script but suggested that it needed some more rewrites. Scott and Morgan hired David Henri Martin to rewrite the script. After they got it back, they reworked and rewrote parts of it and that is what was filmed for the movie. With Manu on board he told his fellow Star Trek cohorts about the script and so they became a part of the project as well. Co-producer Ryan T. Husk suggested his friend, Doug Jones, for the role of Langdon and he also agreed to come on. Ryan T. Husk also mentioned that Hana Hatae would be great for the project and he spoke to her about being a part of it. She agreed and returned to acting after a 16-year break. When Scott spoke with art director Robert Poe, he told him he had this vision of the future where everything is designed by Apple…or that similar design esthetic of clean, simple surfaces. A “hidden complexity” for the technology. The pod is supposed to function as a first class craft for the very elite members in the film, so everyone added a lot of elements to make it comfortable and posh. As for cinematography, Ioana Vasile did an awesome job in re-creating the style of the “Alien” era films. Even though they shot on digital (RED Epic), they wanted it to feel like celluloid. To achieve that they went with vintage Russian lenses, Lomo Anamorphics. The sets had a lot of white, but Scott wanted the film to have a dark mood so Ioana did some great creative lighting to get that. A lot of practical lighting was used too…lights built into the sets. 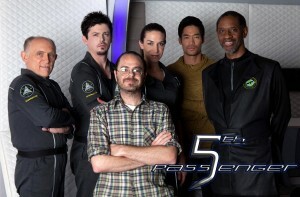 Thank you very much Morgan for sharing all that information about the 5th Passenger’s development and filming details. Exciting how everything came together and 5th Passenger is sure to entertain us! Now, 5th Passenger wants you on board and is looking for fan contributions through Indiegogo to provide the best possible VFX for the film. Currently working on the effects are a couple extremely talented experts, Tobias Richter with The Light Works and Mike Phillips with Bayou Pictures. Go to the website for more information about the film and the campaign including exciting photos and videos. 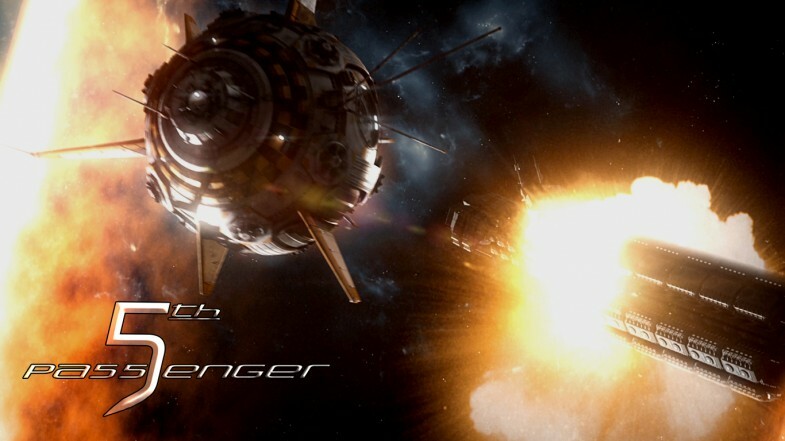 To keep updated on all the 5th Passenger news, be part of their social sites.